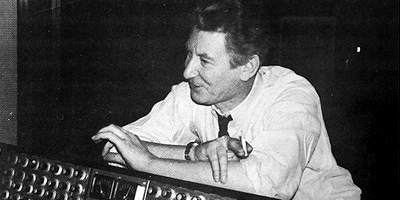 Frank Cordell composed music under the name Frank Meilleur or Meillear (Meillear being his mother’s maiden name). Cordell composed over twenty major music scores including The Voice of Merrill (1952), First on the Road (1957), The Rebel (1961) starring Tony Hancock, The Bargee (1964), Never Put It in Writing (1964), Khartoum (1966), Mosquito Squadron (1969), Ring of Bright Water (1969), Hell Boats (1970), Cromwell (1970), Trial by Combat (1976), and God Told Me To (Demon in the U.S.) (1976). Between his film scores Cordell wrote concert hall works including the Concerto for Cello, the Concerto for Horn, a wind quartet entitled Interplay; also pieces for saxophone quartet, Gestures and Patterns, and mood miniatures such as Production Drive. VIDEO: Music composed by Frank Cordell for the movie Khartoum (1966).